Diets Screw Up Your Metabolism. When you diet you restrict your eating and essentially don’t eat enough food. Over time this slows your metabolism down because your body thinks you’re in a famine and begins to preserve energy to keep you alive. Metabolism slows while you’re dieting, but research suggests that it doesn’t necessarily improve, even with weight regain. One study (from The Biggest Loser participants) found that after 6 years, even following weight regain, there were continued metabolic adaptations of starvation. Translation- metabolism was slower for people who had dieted- the more weight lost, the slower the metabolism- the slower metabolism means the less energy your body needs to maintain your weight. Diets mess up your head and your relationship with food. When you’re dieting food consumes your mind. All you can think about is what you can and can’t eat, if it’s time to eat, how much is allowed, what you’re eating vs what you desire to eat. Everything begins to look appealing and sound good. When you fall off the diet plan- which you will- you find yourself thinking in an all or nothing pattern of- I’ve blown it and will start over tomorrow or Monday. This thought pattern usually leads to overeating the rest of the day or the week until dieting/restriction is resumed. Labeling foods and this type of all or nothing thinking make you feel guilty, bad, and ashamed- that you’re a failure. There’s more focus on your eating and weight, which just increases your thoughts about food. It’s a horrible vicious cycle. The only way to stop is to stop dieting for good and change how you think about food. Diets predict weight gain. Seriously. There was a study done in 2007 by medicare looking for the best weight loss plan. At the end of the study the researchers were surprised to find that people who participated in formal weight loss programs were more likely to gain weight over a two year period than those who had not. They concluded that attempts to lose weight (dieting) were related to future risk of major weight gain. Diets make you less healthy. Research shows that the act of dieting increases cortisol levels. Shame from failure to stay on the diet (because it’s literally not possible) causes an increase in cortisol and cytokines- both essentially markers of increased inflammation. Weight cycling (weight loss followed by weight regain- which is essentially what all diets are since 95-98% of all diets result in weight regain) is correlated with increased risk of illness and death. Diets alter your physiology. Reduced intake can lead to altered digestion- mainly constipation. It can also lead to dry skin, brittle nails, feeling cold and your hair falling out. Why? These all require energy and if your’e not getting enough energy they will be some of the first systems to compensate and conserve energy (slow metabolism- see number one). Diets make you think about food more. When you restrict your eating you’ll be thinking about food all the time. One study said that the time spent thinking about food doubled from non-dieters to dieters 30-60% of the time. (That number’s even higher for people struggling with an eating disorder.) Logically, it makes sense. It’s a survival mechanism. Hundreds of years ago the hungry person who stopped thinking about food and where it was going to come from died. Thinking about food when you’re not getting enough is survival of the species. 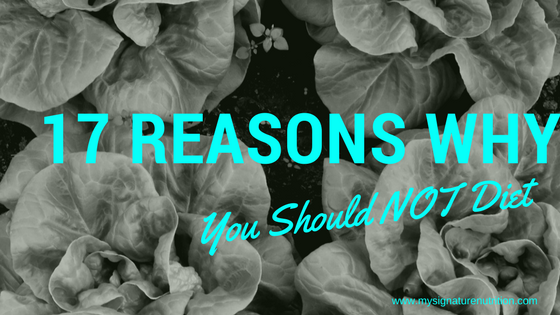 So of course, when you’re restricting your intake- you’ll be thinking about food more. Diets make you tired– not just from the lack of energy but also because of the serious impact on your sleep. Diets make it difficult to go to sleep and/or stay asleep. Why? Survival mechanism again. Body’s that aren’t getting enough energy are kept awake by hunger to look for food. 100s years ago it was more important to find food to sustain life than to sleep. The person who slept instead of finding food died. So again- survival of the species. Diets make you lonely- they take away from social experiences. While you might feel like you “bond” with friends over a diet. The opposite is true. Instead of connecting with friends and family you begin avoiding social events where food not allowed is served, you stop going to lunch with friends after church because nothing you can eat is served there. You basically just eat at home and don’t do anything. That’s isolating. Diets are expensive! Seriously. What if you had all the money back that you’ve ever spent on dieting? How much more would you have? Diets destroy balanced eating. In a diet you have “good” and “Bad” foods or allowed and not allowed foods. As soon as you start labeling foods as good or healthy and force yourself to eat them- these will become the very foods that you don’t want to eat. The foods that aren’t allowed will be all you can think about and crave to have. So of course, when you’re not dieting you’re eating all those “bad” foods. When you’re dieting you only allow yourself to have the permissible, “good” foods. There becomes no such thing as balanced eating. You’re either on a diet or off a diet. Diets make you annoying. #SorryNotSorry- it’s true. Diets make you annoying to be around. They change your personality and make you moody, irritable, and apathetic. You become a different person. It makes sense- you’re not getting enough food. You’re brain is hungry of course you’re irritable. But even more annoying is that when you’re on a diet there’s some weird thing that happens that makes you have to tell everyone about it. Plus since you’re thinking about food all the time, it’s all you talk about. It’s so annoying. 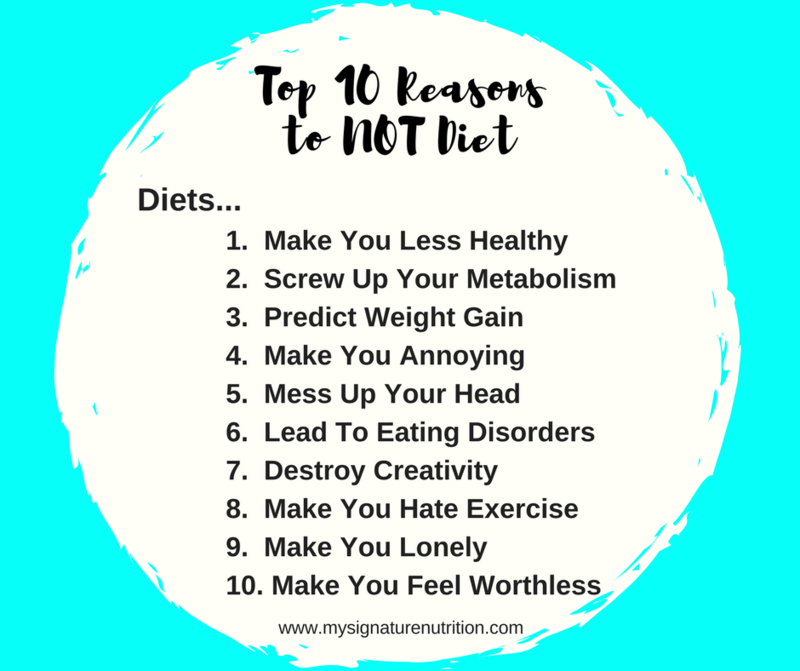 Diets lead to disordered eating and eating disorders. 35% of diets progress to pathological dieting and of those 25% progress to a full blown eating disorder. While diets don’t cause eating disorders, every eating disorder begins with a diet. You may think- that won’t happen to me- so did every other person who had an eating disorder. Diets destroy innovative thinking. How much more could we get done if we weren’t thinking about food, weight, bodies, exercise all. The. Time? The world would be totally different because your focus would be on things that really mattered! When children start fixating on food and dieting it’s seriously a loss of potential. Who knows what they would have done or accomplished had they not been sucked into diet culture. Diets make you apathetic/ steal your energy and focus. I wrote about this with diets make you annoying- but diets change your personality. Since you are literally deprived of energy of course you don’t want to do anything else. Things that interested you no longer do. Your energy and focus are on dieting and food there’s little room for anything else including fun, relationships, preferences, and your personality. Diets make you feel worthless. True story. Because diets don’t work and lead to weight regain- when you fail at your diet (whether it’s the first or 200th) you feel bad, like a failure, guilty, ashamed- worthless. You feel that you are not worthy as you are. Dieting and diet culture reinforces the thought pattern that your worth comes from your body and your ability to control it and lose weight. This just keeps you in a cycle of feeling bad. 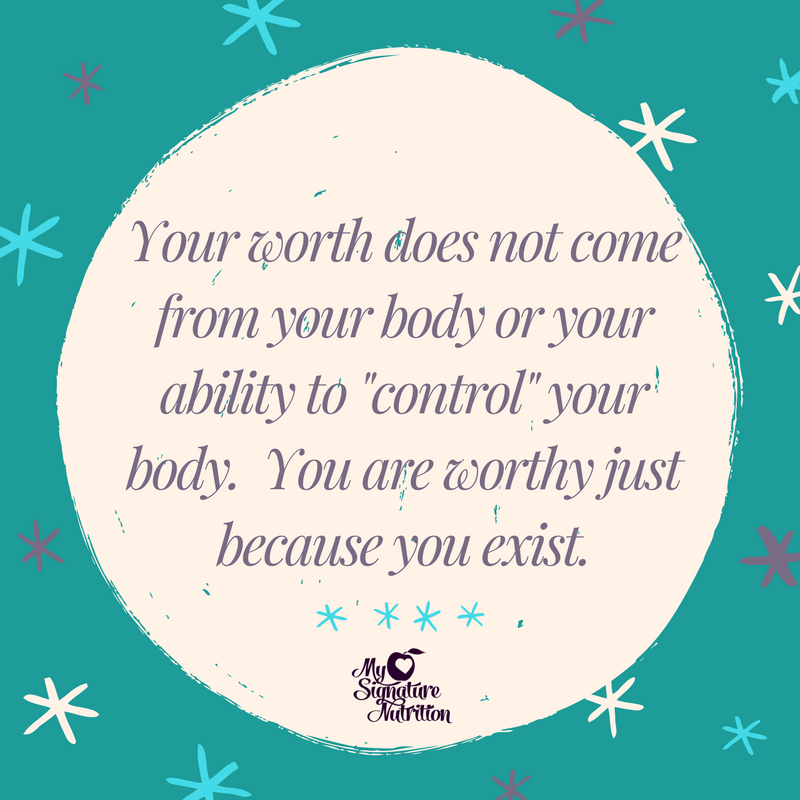 Reality check- your worth does not come from your body or your ability to control your body. You are worthy just because you exist and you’re you. Dieting makes you hate exercise. Exercise becomes something that you do when you’re dieting. When you’re on the diet you exercise, when you’re off- you don’t. Plus when you’re dieting and restricting your intake exercise doesn’t feel good. You really don’t have the energy that you need. And typically while dieting, exercise isn’t about enjoyment or fun- it’s punishment and compensation. That doesn’t feel good! So what’s the first thing you do when you stop dieting (besides reaching for that forbidden food)??? Stop exercising. Unfortunately when you stop, you also lose all the benefits of exercise beyond weight. There’s no motivation for you to exercise if you’re not dieting because you begin hating exercise and believe that it’s something you do while dieting. Exercise becomes fused with weight loss when really there are LOTS of reasons to exercise beyond weight. Those are completely overlooked though when you’re stuck in diet culture and hate exercise. Moral of the story- don’t diet. Just Don’t Do it! Want to get away from dieting- get my free guide to rejecting diet culture! Point 7 and 12 resonates personally with me. It’s when someone says don’t think about the pink elephant and all you can think about is just that. WOW! Thanks for this wonderful information. I’ve tried dieting so many times and i always end up binge eating and feeling worthless. I always thought it was my fault. Now, no more dieting for me , am done.